Reading rocks is the task of survivors. When I remember how many “holy” sites I have visited over the years, the one thing they have in common is eternity. Rocks, stones, boulders, age, having been here since time and earth began. There is some sort of spirituality in walking on, through, by or touching and seeing what man has created as altars or tributes to something or someone by moving, carving, re-thinking and sanctifying these historical ingredients which keep us flying through space and life. The point of visiting Cambodia (Siem Reap) is to marvel at the architectural endeavor called Angkor Wat, the largest religious complex in the world, 30 miles long by 40 miles wide. 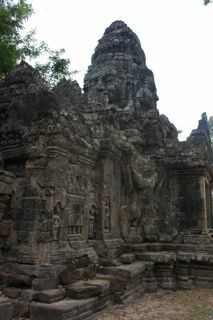 All of it is surrounded by moats and tall walls the top stones being carved with primitive tools to resemble the long body of a wavy naga or snake-serpent. This is naga-town and the five headed naga with its enormous forever body is symbol of protection, power, water. The primary temples were constructed between 802 and 1431 A.D. which was “mas o menos” the same year when Macchu Pichu rose in Peru and the Sistine Chapel was constructed in Rome and all three included some form of an arch - the keystone style of these two but Angkor Wat’s was carved and cantilevered to form a vaulted roof. I picked a difficult day to visit - last day of the celebration of the New Year in all of South East Asia and it was crammed with tourists from Thailand, China, Japan, France and Cambodians, so much so it was hard to walk the stones. Falling, stumbling, losing balance is always a possibility and then scenes scratch across your eyeballs in horror - as people bring out their distorted children to beg for money. It’s so hard to see these live distortions of the human figure - one child’s head was bigger than a basketball on a year old body, or a girl who had been burned all over her body howling for attention. When you flinch and turn away or hide your eyes, it makes one re-consider how really Christian you are. At least it did to me. God says love everyone and especially the hard ones. These are the hard ones. The tourist suffers in many ways visiting Angkor Wat. There’s miles to go to see it and to see it all - 650 temples found so far - is impossible. 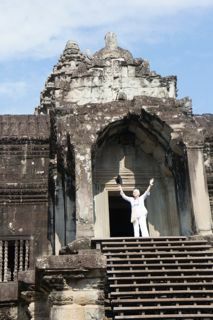 Then there is the 100 degree sun beating down on you as you are determined to climb to the top of one of the temple towers - because it’s just what you do and the guide tells you that the view from up high across the whole deal is worth the effort. Conveniently the preservationists have build sturdy wooden steps with iron railings so there is some safety. Once I got to the top, sweating like a wrestler in a pinch, I didn’t give a hoot about looking at anythingThe landscape view is a bit tarnished by the intrusion of tents and ladders and machines related to restoration. 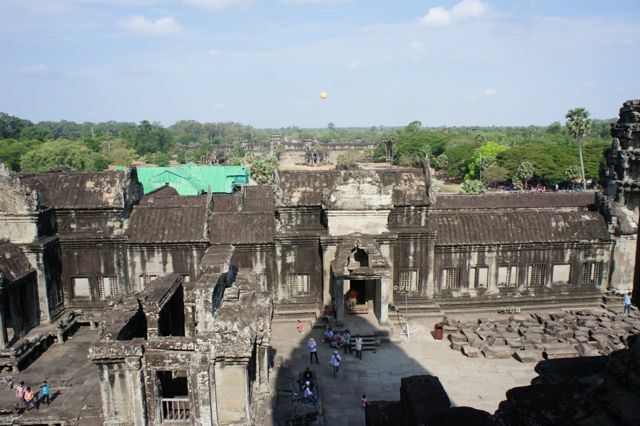 Angkor Wat is continually being restored by nations such as the US, France, Thailand, Japan, China, Switzerland, Germany, and on and on. 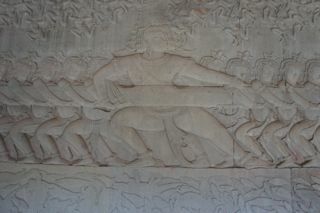 On the way back down, we came to the most glorious of bas-reliefs in the whole complex: The tale of the battle between the Divas (good folk) and the Asura (bad guys) for the nectar of immortality. Vishnu stopped their war between good and evil and suggested both sides churn the sea of milk. He knew that the nectar lay at the back of the sea. Uprooting Mt Mandao to use as a pivot underwater, he became the “referee” and a forever snake with five heads at each end was the “rope” for this tug-of-war. The repetition of form in this bas-relief is skilled and purposeful so you really feel the pull of both sides, with Vishnu in the middle. He pulled part of snake out of the ocean and twined it around the mountain, which rotated as the pull energized back and forth. Vishnu sends an avatar as a turtle to support the mountain. The milk in the sea as it was being churned became not butter, but a host of Apsaras, heavenly women, angels, celestial dancers who created life. Then Asura stole the Asparas. Vishnu comes to the aid of the good guys by transforming himself into a beautiful lady so the bad guys were so seduced by her desire they got their minds diverted from their obsession for the nectar of life. Vishnu grabs the nectar and then shares it with the good guys, the Divas. End of story of creation. So many entrances are long walls of stone men with big feet pulling the snake that goes for miles. It was pretty impressive. The Angkor National Museum, built by the Thailanders, was one of the most incredible museums I’ve been in, on a par with that in Mexico City and in the circular style of the Guggenheim. First Wow was walking into the gallery of 1000 Buddhas, most in dramatically lit tiny niches. 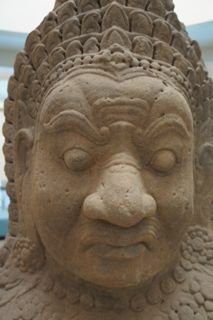 But also in this museum one sees stone at its finest, carved into figures, stories, designs, repetitive shapes: giant heads, headless figures in typical dress; heads with hair designs that would make any hair-stylist marvel. 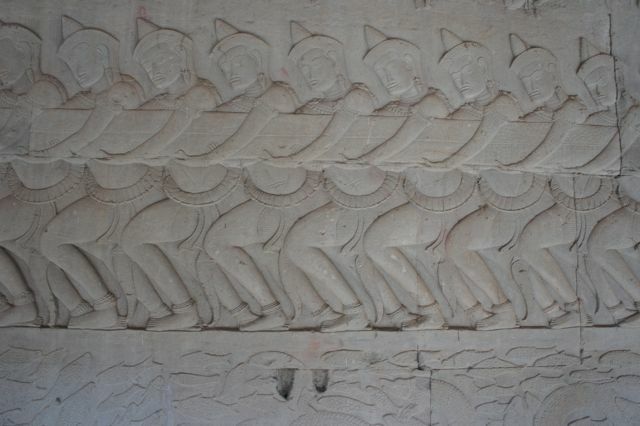 Imagine carving fashion in sandstone. Good records of what was. 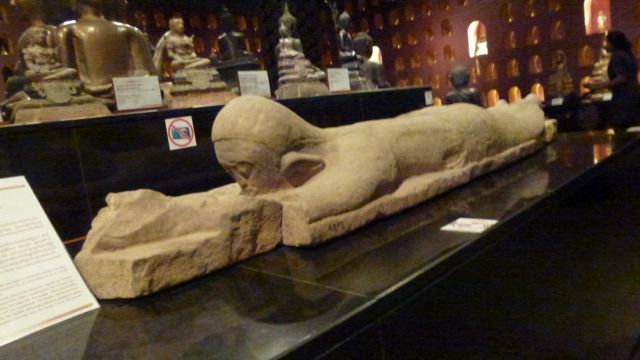 Strolling through the galleries, I was moved by another story when I saw a prostrate figure of white stone, not something you see in Hindu or Buddhist art work. This was a Brahman man Sumedhapandita, a wealthy person who adopted a life of renunciation to be an ascetic hermit in the forest so as to obtain enlightenment, i.e. he gave up all his possessions. Once traveling through the air (release of burdens lighten you, I presume) he saw a road struggling to be completed for the arrival of the Dipankara Buddha and it wasn’t making progress. So, Sumedha made his body into a bridge - a prostrate position - lying on a garment of black antelope skin in the mud so the Buddha did not have to step in the mud. It was a grand gesture like a gentleman (where are they?) taking off his cape and placing it over a puddle of water for a lady to pass without wetting her shoes. When the Buddha saw this, he explained Sumedha would be a Buddha, eventually, and he also received this forewarning from 23other Buddhas. Seeing such a humbled man, prostrate as one must be willing to be before bishops and clergy at the time of ordination, pinged my heart as I remembered that moment in my life: making myself a bridge from one world to the next by serving God and the people. I wish we ordained clergy took that more seriously. Another goddess seen often in Hindu art is Durga, the energy of the Shiva, the female aspect of his destructive power produced from radial flames issued from the mouth of Brahma, Vishnu, Shiva and others to destroy the buffalo demon who had conquered the celestial kingdom and driven out the gods. 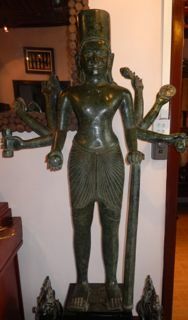 Durga appears as a celestial beauty with ten arms into which god delivered weapons (think “armor of God in our faith): there is the discus from Vishnu, the trident from Shiva, the bared-roll (looks like a weight) from Brahma, the conch shell from Varuna, the flaming cart for Agni, the bow for Vayu, the quiver and arrow for Surya, the iron rod for Yama, the thunderbolt for Indra, a neck of pearls from Milky ocean, a lion from a charger for Mt. Himalayas and a wreath of snakes from Ananta. Thus armed, Durga could eliminate demons. Pretty neat, huh?A personal army of things to warn off evil. 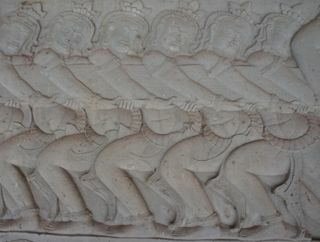 Just to be clear, there are nine divinities in 10th century Angkorian art: Surya: the Sun god on a chariot; Chandra, the Moon god on a pedestal; Yama, the god of Death on a buffalo; Aruna, the god of Rain on a Swan; Indra, the god of Thunderbolt on an elephant; Kubera, the god of Wealth on a horse; Agni, the god of Fire on a ram;, Rahu, the god of darkness in the cloud (who produces Eclipses); and Ketu, the god of producing Comets rides on a lion. And from another point of view, that of the Dikpalas, or guardian of directions, it’s this way: Kubera on the horse, guards the North; Skanda on a peacock, guards the northeast; Indra on an elephant, guards the East; Agni on a rhinoceros, guards the southeast; Yama on a buffalo, guardian of the south; Niruti on yaksha, guardian of the southwest; Varuyna on a swan, guards the west and Vayu on the lion, guards the Northwest. 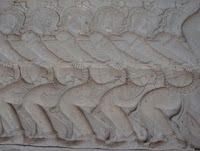 These images you will see often in Angkor art and probably other Hindu sites as well. Now you can rest at peace knowing all this. God bless. I enjoyed reading about your most recent experience, but it does sound challenging with the heat! I find it fascinating to think about the ways in which civilizations constructed such enormous structures without modern resources. It is awesome to me that such structures were build around the world at virtually the same time. Thank you for such detailed information. I am learning a great deal about a part of the world that has always been a mystery to me. 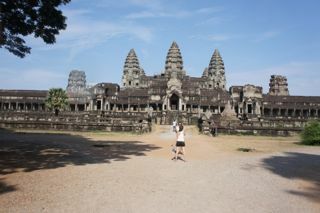 Angkor Wat with its 650 temples is obviously one of the most amazing places in the world. Once again your words made us feel like we were right there with you. Now, it might be a good idea to replace the dogs that guard the Juvenile Court with Nagas. They look a lot more ferocious than our dogs. Also, we need to borrow Durga and the Divas so they can help us work through a few little problems. Our friend, Herb, is having trouble with his investments and would like for you to speak to Kubera, the god of wealth , for him. Climbing in 100 degrees doesn't sound very wise. Please be careful and take care of yourself. P.S. The gold statute of Durga bears a resemblance to the Goddess Selket (minus the arms) whose statute was found in the tomb of King Tutankhamun. Selket was the divine scorpion goddess of the Ancient Egyptians. She was the goddess of magic and the underworld. Since Durga was a good god, he and Selket probably wouldn't have gotten along very well. You mentioned that this would be one of your visits. It blows my mind to think of the thousands of man hours to build such a holy place. Or Macchu Picchu. Or the Sistine Chapel. All done to glorify god (or the gods). My how things have changed. Now we build shrines to money. Glad you made it to the top. Was it more difficult than the ziggurats of Central and South America?